This Burger King sign toppled onto the Burger King along Rising Sun Avenue in Philadelphia on Feb. 24, 2016. A string of severe storms caused damage throughout the Philadelphia area and toppled a fast-food sign onto a Philadelphia eatery. 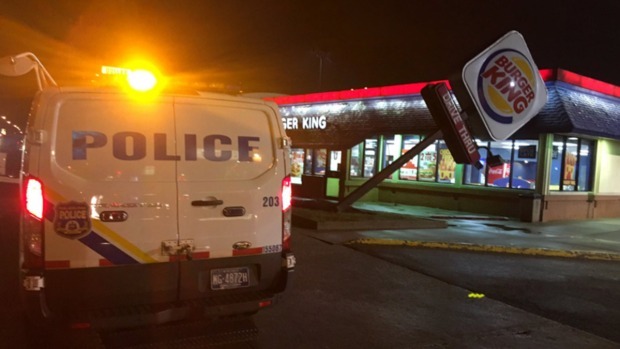 The Burger King sign fell on the fast-food joint along Rising Sun Avenue near Van Kirk Street in the city’s Lawncrest section sometime before 8:20 p.m. Wednesday. Witness Ryan McKinney said the winds felt hurricane-like when the sign toppled onto the roof. Wind gust neared 50 mph at Philadelphia International Airport Wednesday night and could have been even stronger in Northeast Philadelphia, said NBC10 First Alert Weather meteorologist Bill Henley. Wednesday's storms caused significant damage in Philadelphia and Montgomery County. NBC10's Randy Gyllenhaal takes a look at the damage, including a home that was struck by a fallen tree. No word yet on how much it will cost to make repairs.